What is the major difference between average and world-class IT organizations? The right measurement approach helps top-performing organizations focus their efforts in the right areas. This leads to hard-dollar savings for the company, improves the value that IT delivers to the business, and creates a culture of excellence. ► Global’s consulting approach matches data from high-performing peers to your environment, providing a truly actionable and real-world outcome that ties directly to your financials. Our team will work closely with yours to gain a detailed understanding of your current IT management approach. Then we create a customized comparison group to match. This means no areas will be left out of scope. Complete coverage of the IT landscape ensures the roadmap and action plan resulting from this study won’t overlook key variables or constraints. 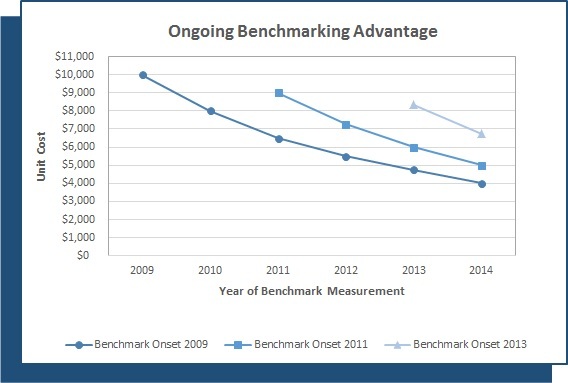 Global observes a significant cost advantage for organizations that benchmark regularly over those new to the discipline. ► Global’s focus areas range from IT Benchmarking to Organizational Assessments to Running IT as a Business.